To an outsider, "redemption" does not seem like the right word. The Richard Montgomery boys usually compete consistently at a high level and rarely flop. They also don't seem interested in redeeming themselves against any particular opponent. They proved to the state that they are champions when they won region and state titles in the 4x800 relay faster than they ran indoors last year, but even still, the bad taste from last year's National Scholastic Indoor Championship remained. 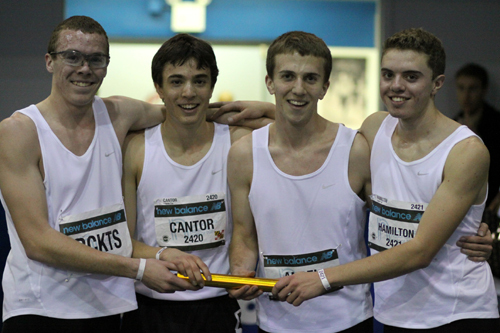 Last year, RM's 4x800 ran over a second slower at nationals than they did at the state championship. As Sam Martin told Mocorunning in an interview earlier this season, "We don't want to be seen as the team that gets to the big meets and then 'chokes.'" Being a team of individuals with high expectations, redemption was on their minds for a full year. Coach Davy Rogers even used the word "redemption" again just prior to the race. What exactly would be a satisfying time? "7:56," Rogers said� hesitantly. David Hamilton led off for the first time this season because they wanted to be prepared for a fast start with the potential for some jostling. It was actually Fola Shokunbi from Good Counsel who set the fast early pace and pulled Good Counsel through in second place with a 1:57. Hamilton came through in about 1:59 somewhere in a mix around fourth place. Jacob Cantor made up some ground and put his team right up in contention with a split of about 1:56. Coach Rogers said Cantor had been a little "flat" in the days leading up to today. According to Rogers, Zachary Angel needed to run close to 2:00 for the 7:56 target to be accomplished. Angel had some competition from a speedy runner on a team that had been lapped. He ran a personal best time of 2:01. By the fourth leg, RM was still in second place with a few teams close behind. Winning the heat seemed almost out of the question with Rush-Henrietta nearly 50 meters ahead at the handoff. When Sam Martin got the baton, he did not immediately try to catch the runner from Rush-Henrietta. Slowly but surely, the leading runner began to fall back to Martin and by the last curve, Martin zeroed in on his target. Throw the time out the window. Martin wanted to win his heat and he timed it perfectly. The come-from behind win coincided with a 1:55 split by Martin and a first place heat time of 7:52.63. It was a season-best time by over ten seconds and held up for the sixth fastest of the day. The boys who sought redemption are now All-Americans. Day two of New Balance Indoor Nationals primarily consisted of trials to qualify for finals on day three. Three athletes who earned their slot to compete on Sunday are Sean Sutton (200, 400), Olivia Ekpone (60, 200), and Thea LaFond (60m Hurdles). We will also see LaFond in the triple jump, Russell Hornsby and Thomas Tallerico in the 800, and the RM and Good Counsel boys in the 4x400. No mortal completely understands the complexities of why there were previously two indoor national championship meets, but with this being the first year of a consolidated indoor national championship meet, the increased depth of talent was evident. Take for example Olivia Ekpone from Northwest High School who has made the finals numerous times at national-caliber events. Ekpone ran an indoor personal best 200m time of 24.47 and nearly missed the finals. Heat after heat was won in under 24.40, making it a nail-biting experience to see if she would qualify for the finals. She took the eighth and final spot. The Northwest girls 4x200 was not so fortunate. A season best time of 1:42.78 was only good enough for twelfth place overall. A time like that may have earned All-American honors at the previous indoor national championship meets. Magruder girls ran a season best 4x200 time of 1:44.51 and season best sprint medley time of 4:19.01. It is noteworthy that Northwest, or the "Maryland Titans Track Club," used Kennedy Knight, a middle school athlete on their 4x200 relay team. All members of a relay team are supposed to be from the same school, meaning thou shalt not form super-relays with the best four kids across three county lines. However, it is not unheard of for middle school athletes to compete at National Scholastic Championship events and their website says that "exceptions may be made for athletes in lower grades." Being that Kennedy Knight will compete for Northwest next year, it was acceptable in this case. According to Coach Buddy Crutchfield, Sean Sutton's personal spike bag was "misplaced" or potentially stolen just prior to his first race. He bought brand new spikes just prior to the 400-meter race and blew away his heat in 48.50 to easily qualify for finals. Later he returned and had to work a little harder to win his heat. He was first to the tape with a new personal best time of 21.70. Springbrook's Dee Dee Akpaete ran an indoor personal best 400-meter time of 57.55. Congrats to all the Moco athletes who represented our county so well in NY!!! I'm shocked that Olivia Ekpone only came in 8th to get to finals. She always seems unbeatable here in Moco. If Olivia was 8th, I'd love to see the people who placed above her run.